A little hard to find food that is really typical of Ternate. Because geographically closer to North Sulawesi, of course, food Ternate heavily influenced - and also affect - a typical food of North Sulawesi. 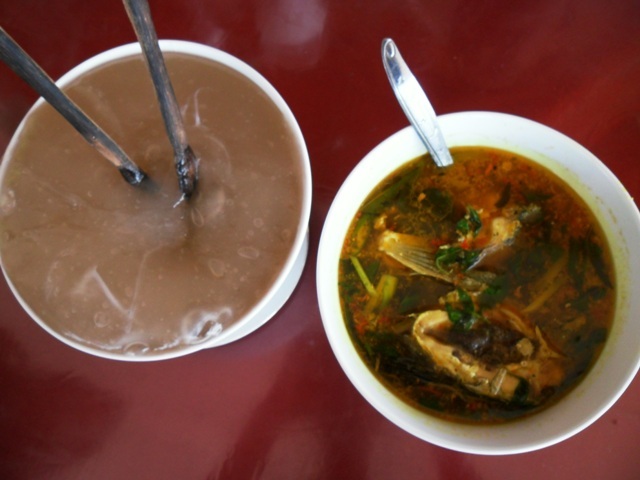 However, because of Ternate in North Maluku archipelago is a group, then surely also traditional foods easily found in Ternate, Moluccas.Almost all dishes involving walnuts Ternate, both as a spice grind, and coarsely chopped.One of the specialties of Ternate is gohu fish. That it must be complete: gohu fish. You see, if you just called gohu, it means the papaya salad is also popular in North Sulawesi. Ternate Gohu typical fish made of raw tuna. Not surprisingly, many people refer to it as sashimi Ternate.Apparently, on the coast of North Sulawesi - for example in Bitung - can also be found like this dish. His name is simply reversed: gohu fish. Perhaps this is what makes it fresh dish bears the name meaning gohu salad. Generally, in Ternate, gohu made from tuna fish (Thunnus albacares yellowfin tuna =). If tuna is not the season, tuna (skipjack) can also be used - even if the texture is not as smooth as tuna.Fresh tuna meat (read: raw!) Cut into small pieces, washed, and then smeared with salt and lemon juice cui (a kind of fragrant lemon yellow and deep-orange), then mixed with chopped coarse balakama leaves (basil). Onion and cayenne pepper (called rica gufu in Ternate) coarsely chopped and then sauteed with a little coconut oil. Coconut oil is hot with onion and cayenne pepper is then poured into chunks of raw tuna. Then sprinkled with crushed peanuts fried rough.Have imagined it like? Top markotop!If you've ever been to Hawaii, you most likely have never met a dish like this. The difference is, there are not taking cayenne pepper and fried peanuts. In Hawaii kemanginya alias replaced with wakame seaweed. This dish known in Hawaii as onopoke.I've also found the dish very similar to this fish gohu - minus the cayenne pepper - in General Santos City, southern Philippines. There, the popular dish is called kinilauw. 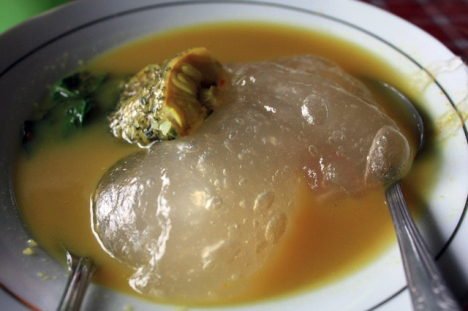 Apparently, dishes like fish gohu Ternate has become the hallmark of traditional communities or islands. Kinilauw wearing only cut cubes of tuna, seared with salt, mixed with rough chopped onion and tomato, and lime juice dikucuri.Gatang WalnutsTalk about culinary Ternate, most people will immediately call gatang Canary (canary crab = crab walnuts). In the past, I've tasted a crab that looks similar to these ancient animals. Now, crab walnuts are listed as a protected species. Surprisingly, it still happens ambiguity to enforce this rule. That said, for the sake of tourism, several restaurants in Ternate get special permission to serve dishes from crab walnuts.Surprisingly also, there are two Indonesian President (note my name for personal gain!) Who love crab walnuts. Local government officials were reportedly often brought gifts for their boss crab walnuts in Jakarta - as if the regulations do not apply to environmental conservation officials.Price is quite expensive crab walnuts. Super-sized (about 2 kilograms live weight), valued at about USD 350 thousand. For the rich, so the price is meaningless. Understandably, one pound Wagyu beef cost about USD 700 thousand. That is, the price of crab walnuts such "cheap" will not save it from extinction.Some restaurants often claim that they provide a crab walnut cultivation. It's a hoax. Crab difficult ditangkar walnuts. Nowadays, most crabs caught in the wild canary in Halmahera, then sold to several restaurants in Ternate.Crab walnut is an intelligent land animals picking and peeling coconuts, as well as making their favorite foods. That's why walnuts are considered more savory crab and sweet crab meat than usual.PupedaTernate people have a tradition of a great meal after after Friday prayers. Usually, from the mosque people rushed home to gather with family lunch. Some went abuzz food stalls with friends.One tradition Friday lunch is eaten pupeda (in Maluku and Papua called papeda) - namely sago cooked with water, shaped like starch glue. Pupeda usually eaten with fish sauce Soru. Who cooked for fish sauce is usually Soru asr (Smoked with fire gonofu aka coco). Soru means sour. Clear broth, with a tone of sour-spicy, and smokey aroma of fish asr. Hmm, impressive.Behind Gamalama market, there are several stalls pupeda popular for residents of Ternate. In the stalls, in addition to soup Soru, also available a variety of side dishes are provided in the table. Likewise pupeda and kasbi (boiled cassava), sweet potato, and banana stew - all provided in a table. Guests eat buffet style, and pay Rp 25 thousand per mouth - sekenyangnya.Pupeda eaten with sauce Soru. 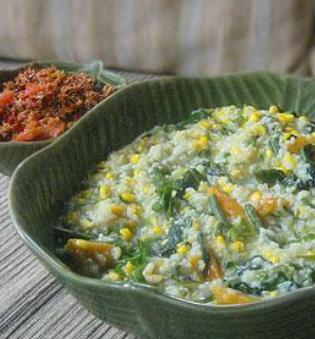 While other carbohydrates eaten with vegetable wax (vegetable known as Jakarta terubuk egg), grilled fish, fofoki coconut milk, vegetable Garo (sauteed kale and papaya flower), and others.